At powwows across America, Native Americans gather for dancing, singing, drumming, and socializing. Most consider the powwow to be more celebration than ceremony, but it contains elements of both. Today powwows are important as central expressions of tribal and intertribal Native American identity. This sense of a broader identity does not replace, but complements the tribal identity Native peoples may have as Navajo, Lakota, or Wampanoag. 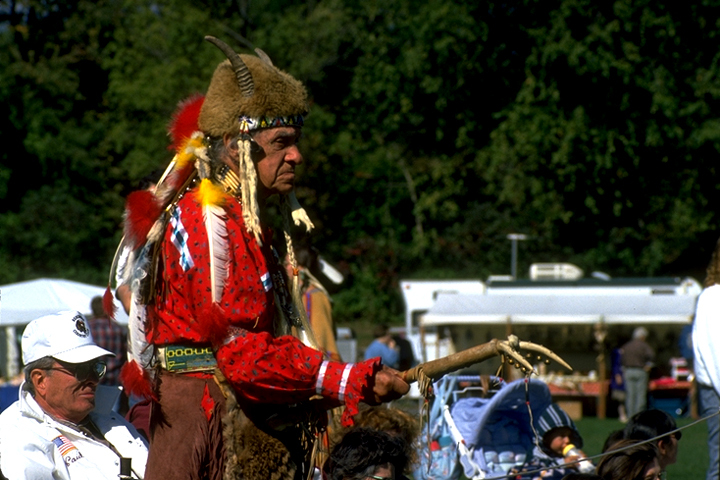 More than 900 powwows are held throughout the United States and Canada each year. They vary a great deal in size and in nature. Some powwows are large commercial events, with dance competitions that attract substantial non-Native audiences. Others are small scale gatherings where singers, dancers, and onlookers are involved in ceremony and prayer as well as socializing. Wherever its place along the continuum between these poles, a powwow is regarded by many Native people of different tribes to be a celebration of their identity as Native Americans. 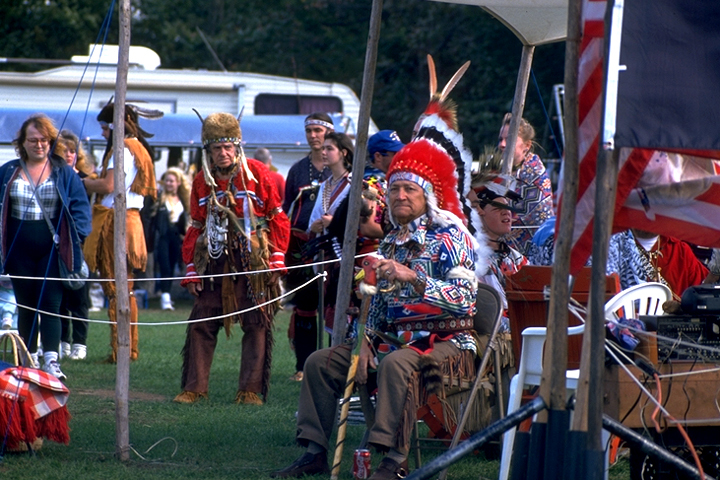 The history of the powwow movement illustrates the celebration’s long association with intertribal peace and friendship. It is said that in the 1870s a young woman of the Lakota Sioux was given a large drum filled with spiritual power and instructed how to use it and how to dance along with it. In her vision she was told that this drum would have the power to bring blessings and peace to all Native peoples. In keeping with this vision, the Lakota shared the Drum Dance with their long-time enemies, the Anishinaabe Ojibwe. The Drum Dance tradition soon spread throughout the plains and woods of the upper Midwest to the Menomini, Potawatomi, Winnebago and peoples of the Plains. Especially in the early days, the dance and the songs were considered to be forms of prayer and were embedded in a rigorous code of ethics and respect. Today, whether as “contest” or “performance,” the singing, drumming, and dancing of the powwow tradition are an important mainstay of tribal ways of life. A powwow may be dedicated to honoring the elders, to giving thanks, to remembering the Holocaust, or to sobriety. Even at contest powwows, special honor-dances take time to recognize the contribution of outstanding young people or elders. In the course of the powwow, dancers, drum groups, and visitors often share a large feast prepared in their honor by the host community. Around the outer circle of the powwow grounds burger and “Indian taco” stands, along with jewelry and gift stalls, create the atmosphere of a fair. Give-aways may be scheduled to coincide with powwow celebrations. In the give-away tradition a family honors the memory of a loved one or celebrates a special occasion by saving up and providing gifts to others. Give-aways express an old and widely held ethic of sharing wealth by giving away prized articles, including such traditional gifts as blankets, beadwork, and homemade quilts.